The International Livestock Research Institute (ILRI) and the Agriculture Quality Research Laboratory of the Ethiopian Institute for Agriculture Research (EIAR) recently jointly conducted a training workshop on stationary and mobile Near Infrared Spectroscopy (NIRS) use and application in Addis Ababa. Participants came from EIAR HQ and research stations in Melkassa, Kulumsa, Debre Zeit and Holetta, private sector food and feed laboratories and ILRI. 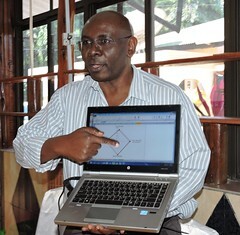 Training sessions were held in EIAR and ILRI laboratories. The training had several objectives foremost laying the groundwork for a NIRS hub in Ethiopia that would connect CGIAR, national research and private sector infrastructure capabilities. 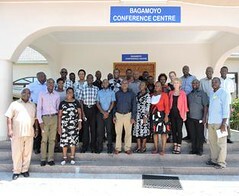 This hub will harness synergies for quick, affordable and non-destructive feed quality analysis, feed certification and feed price-quality relationships and for phenotyping in multi-dimensional crop improvement. The course covered: 1)Revisiting Basic handling of NIRS instrument (here we have FOSS 5000); 2) Develop and validate predictive NIRS equations for feed quality analysis; 3) Maintenance and updating of a regional global NIRS Technology platform; 4) Master instrument approach: Sharing of standard samples for spectra calibrations; 5) Practical training and validation of the spectra from FOSS range of NIRS systems and interpretation of the results; and 6) Mobile and hand held NIRS instruments. As an immediate outcome of the training a wide range of NIRS equations developed for ruminant, monogastrics and fish feeds and feed ingredients and for crop residues sorghum, pearl millet, rice, wheat, maize, barely, groundnut, cowpea, pigeon pea, lentils, faba beans and chickpea as well as for a range of green forages developed during the 1st phase of the Livestock and Fish CRP are now available to research institutes and the private sector in Ethiopia (information here). Tags: EIAR, NIRS. Bookmark the permalink.